A fast and easy Asian chicken salad recipe that’s actually good for you! I’ve been wanting to come up with a healthy recipe for Asian chicken salad recipe. 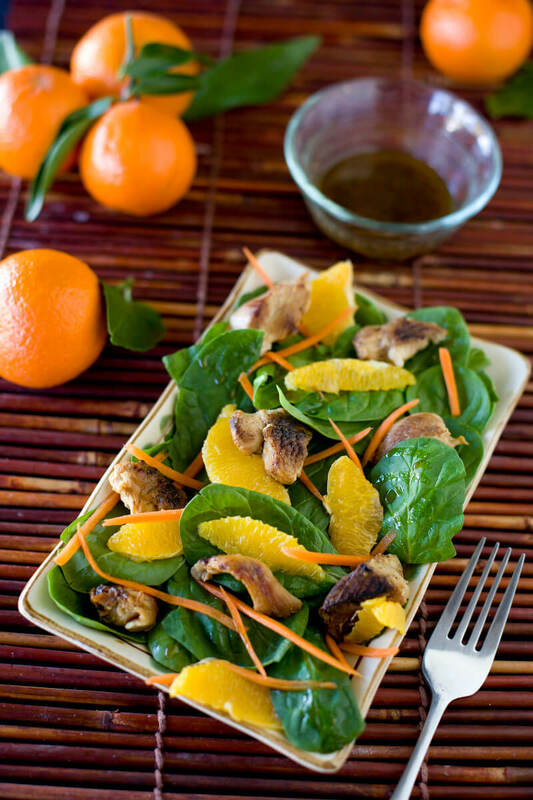 I love the brightness of oranges and tangerines in salad, and combining their juice with some Asian ingredients makes a flavorful dressing. But all to often when ordering an Asian chicken salad in restaurants, the salad dressing is loaded with sugar (as is the chicken marinade) and the the salad itself has mountains of friend wonton strips piled on top. 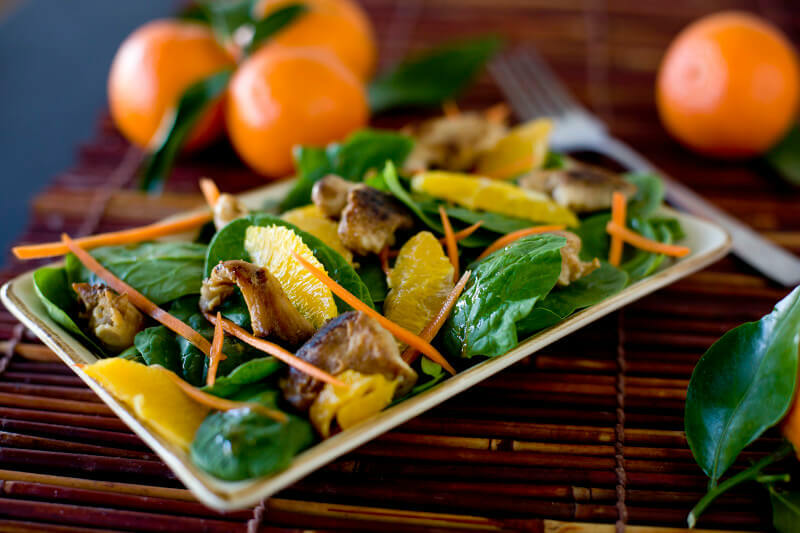 I decided to keep this Asian chicken salad recipe simple by using seasonal spinach, carrots and tangerines to make a flavorful, healthy and easy dinner. I mentioned in my corn and bell pepper soup post that you could expect to see some fancy spinach salad recipes coming up. At the end of winter I’m craving salads and desperate for the freshness of spring produce. But it’s not quite time, so spinach salads are a great way to eat seasonally and sustainably while still tapping into my warm weather fantasies (so are cabbage salads and this apple cabbage slaw is one of my favorites!). The awesome thing about making this a winter weather salad, is that so many different varieties of tangerines and mandarins are in season from early winter to early spring. I’ve now made this salad with clementine mandarins, tangelos, fancy mandarins and even canned mandarin oranges. While I’d always recommend the fresh citrus, if you’ve got a can of mandarin segments to use up, or perhaps get a can from the food bank, this is a beautiful, affordable recipe to use it in. I tried to use simple ingredients, notice the marinade and dressing and very similar. The only difference in ingredients is honey for the chicken and brown sugar for the dressing, and the addition of ginger powder to the salad dressing. Whatever you do, don’t buy the little bottle of ginger powder. You can get spices so much cheaper if you buy them in a bulk section. A lot of grocery stores have a little bookshelf type stand with jars of spices that you can measure out to buy exactly how much you want. That way you’re getting your spices for pennies instead of dollars. For the Asian ingredients (rice vinegar, soy sauce and sesame oil) see if there’s an Asian market in your area. This is always cheaper than the little ethnic aisle at a regular grocery store. If you don’t have one within an hour of you try looking online. A 12 oz bottle of rice vinegar would cost me $4-5 at a general grocery store, but only $2 at Asian Food Grocer. Although there are shipping costs, if you get several items at such a discounted rate, you’ll still save money even with shipping. It’s important to know that while the nutritional info is always my best estimate using various programs, in recipes with a marinade, like this one, the info is not really accurate. You don’t actually consume all the marinade, so the final dish will have a lot lower counts for sugar, sodium, and carbs. An easy Asian chicken salad recipe that's actually healthy! Seal the chicken breast in a heavy duty zip top plastic bag, pressing out most of the air. Use the flat side of a meat hammer (or a rolling pin) to pound the chicken to an even thickness. Remove from the bag and slice the chicken into bite size strips. In a medium bowl, mix together the honey, rice vinegar, soy sauce, tangerine juice and sesame oil for the chicken marinade. Add the raw chicken pieces and stir to coat. Let the chicken sit while you prepare the other ingredients. Divide spinach between two plates and sprinkle with julienned carrots. In a small bowl whisk together sucant (or brown sugar), soy sauce, rice vinegar, sesame oil, ginger powder and tangerine juice for dressing. Set the dressing aside. Heat a wok or non-stick frying pan on medium high. Add marinated chicken and stir frequently while cooking (to prevent honey from burning). Once chicken is a golden brown remove from heat and let cool. Top spinach and carrots with chicken and drizzle with dressing. Approximate cost/serving: I get a one pound box of spinach (which fluffs out enough to feed us for a month) for around $3. Carrots are crazy cheap. The costliest item is chicken breasts, especially if you're going for humanely raised chickens. Still, the recipe only cost me $1.60 to make for two of us, so that's just 80 cents a serving! Vegetarian/Gluten Free: You can marinate chunks of tofu and pan fry them instead of chicken to make this vegetarian. For gluten free use gluten free soy sauce or tamari. This sounds like a great salad for winter. I’m going to try it with roasted chicken leftovers. It won’t have the marinade of course, but I think it will taste really refreshing. That looks so delicious! I love oranges in a salad. I just added some to ours the other night. 🙂 Beautiful photography!